• Features 9m of high visibility Red/White or Black/Yellow chevron tape. Complete Magnetic Wall Barrier Kit including Skipper Unit with 9m of retractable high visibility chevron tape, Magnetic Wall Bracket for attaching unit to a metal object such as a Forklift. Unit attaches to a Forklift and the tape end wraps around a rack support and clips back on itself - easy!! The Skipper simply clicks into the Wall Bracket. 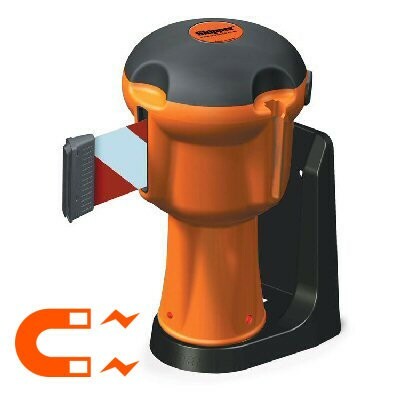 Can be removed and used on top of most traffic cones, saving time, storage space and money. It pays for itself in months over other less flexible barrier systems. Green, Red and Silver Coloured bodies are available for a minimum order of 25 units. Also available is Green/White Chevron tape. Please contact us for details.